Throughout the Fall I often mentioned the Christmas gifts I was knitting but wasn't able to share them with you until after the holidays. A few weeks ago I presented my "Hot Cocoa" Hobo Mitt to you. 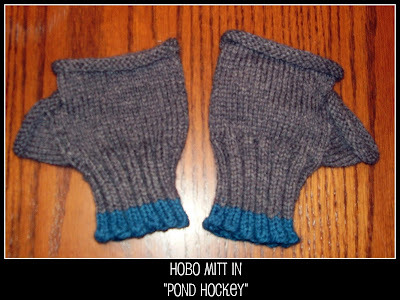 Today, I'd like to show you a similar mitt in a different style, which I called "Pond Hockey." 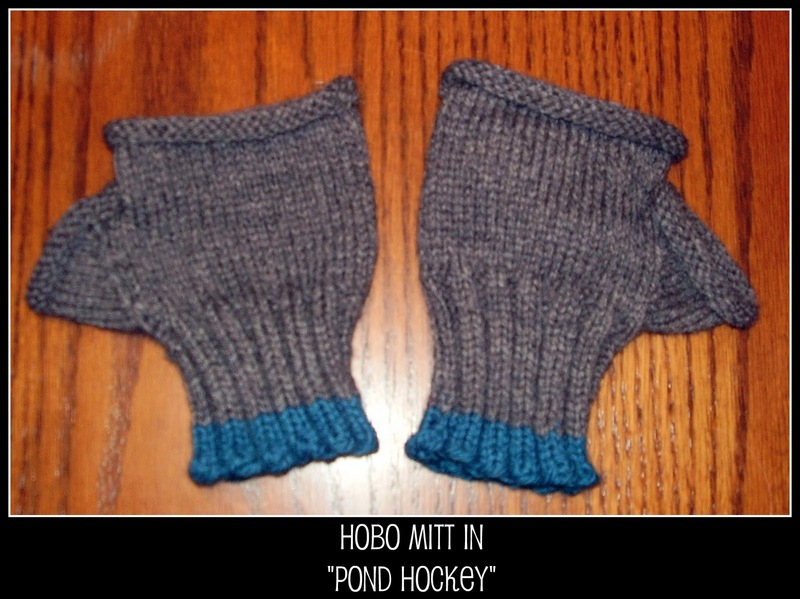 The "Pond Hockey" Hobo Mitt is knit using two shades of Patons' Classic Wool. The majority of the mitt is worked in Dark Grey Mix, while the accent stripe on the cuff is worked in Peacock. Both yarns are 100 gram net weight and are 100% Pure New Wool. These mitts were worked on size 3.5 (US 4) bamboo double point needles. I designed the "Pond Hockey" mitt to wear during outdoor activities (although the recipient of this gift will probably wear hers on trail rides more so than on the hockey pond) so I knit the cuff snug and extra long to keep the wrists warm. The wearer can use their arms freely without risk of exposing their wrists to the cold, while leaving the fingers free. 100% wool is ideal for outdoor activities as it keeps the hand warm even when the garment is wet by wicking moisture away from the skin. Unlike those knit from synthetics, wool garments like these require a little extra care; these mitts must be washed by hand and laid flat to dry. Do you knit? If yes, what are you knitting now?